Oriental Lilies aren't short on perfume, and this bunch is no exception. These beautiful flowers don't just look fantastic, they also have a fantastic aroma.Lilies may be sent closed/partially closed in order to prevent damage and to last longer.Vase not included however to personalise your gift, we recommend adding a Premium Vase to accompany these fragrant Lilies. 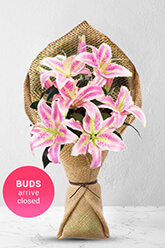 Easy to,order and flowers delivered on time. Our friend sent a photo of the flowers -and they looked very nice. I liked the reminder and simplicity to re order. The flowers were lovely and made for a great experience. Very efficient service and quality of product is good. Thank you. Awesome delivery?? Great stuff guys! I was pleasantly surprised when the delivery was made so promptly. I thought that I had missed the dead line for the day. An excellent service. Thank you. You guys are the best. Thank you so much! Your service is so reliable. My twin sister was very happy to receive her flowers for our birthday. My daughter in law got theflowers on her birthday 7th and saidthey were lovely. Mum said her flowers were beautiful thank you :)!